Victrola label is proud to present Elvis’ powerhouse concert in Greensboro Coliseum on April 14th 1972. So what makes this new release so special? Yes, it has been released before, most recently on the Amiga label boxed set ''Elvis On Tour - Deluxe Edition''. But this release blows that set right out of the water! You will not believe the sound, which for the first time comes from the actual RCA tapes. Yes, you read that correctly. For the first time, these are actual multitrack master recordings, and not the nafta tapes that have been used this far as a source for this show. On the box set, it was even presented in mono (sloppy, that) and Madison released it earlier in narrow stereo on "Greensboro Revolution". The recording that we obtained was mixed down from the original 8- and 16-track masters fairly recently, but then, oddly enough, stored back in the vaults. We know you will be thrilled when you hear this recording, which has the signature of the best Elvis live mixes released officially thus far. The wide, dynamic stereo sound is just friggin' unbelievable and puts you right in that Greensboro audience. That may sound like hype, but just wait for the samples! Elvis at the peak of his powers, April 1972, driving the audience into a frenzy... And you are right there! Do not miss this sonic delight, which may well be your favorite Elvis live album in the years to come. That's how good this is. We are clearly thrilled to be able to release this for you, from the actual mastertapes, in a fresh, professionally mixed stunning stereo sound. As a bonus, we've added a bonus disc featuring sacred performances and additional live songs in glorious stereo, as well as the unedited ''Funny How Time Slips Away'' from the April 5th 1972 rehearsal (badly butchered up on the aforementioned box-set). These days, there aren't a lot of surprises left in the Elvis world (wasn't that "Searcher" film a real doozy? ), but this is definitely one of them. Grab it while you can! We do understand some people will be sceptical about this project, but for once, this is what it is! To assure these people, we will be posting samples soon, so that they can compare & make graphics to their hearts' content. This is the real deal, folks... And one project that we're damn proud of. A killer release that deserves to be in your collection. 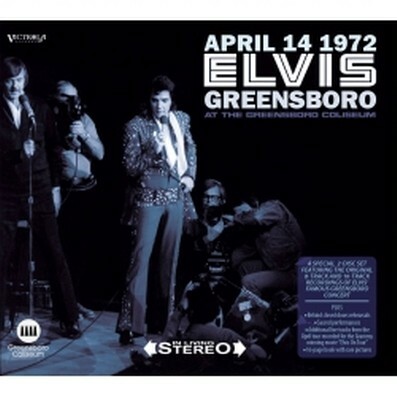 We are proud to announce too, that ''Elvis April 14, 1972 Greensboro'' will be released later this year on 180grams vinyl in a beautiful gatefold sleeve, and with a large booklet filled with many rare pix. The Victrola label is planning more releases in 2018, so stay tuned!